A 27-year-old Laval University student, Alexandre Bissonnette, has been charged with 6 counts of murder and 5 counts of attempted murder while using a restricted firearm (CBC). The attack is considered an act of terrorism. Alexandre Bissonnette was a fan of Mr Trump. There were vigils on the evening of 30 January 2017 and both the Ottawa and Quebec Parliament’s flag were flying at half-mast. The current outpouring of sympathy towards the Muslim community will not take the victims back to their family and Muslims are afraid, but I hope it will be of some comfort. 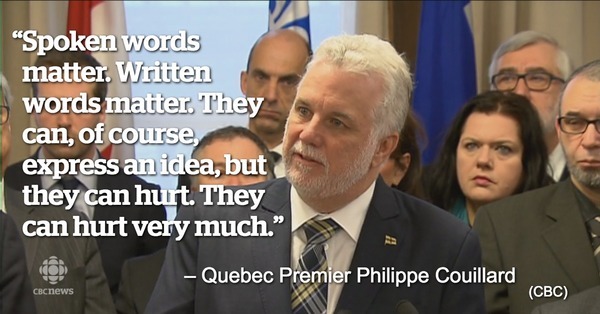 Quebec Premier Couillard has made it very clear that Canadians had been killed and wounded. I have yet to hear how Canada plans to protect its Muslim citizens, but I presume police surveillance will be increased. The shootings are particularly egregious since they occurred while Muslims were worshiping. This tragedy has hurt Canadians profoundly, from coast to coast, and especially Quebec Canadians where interculturalism has been adopted. 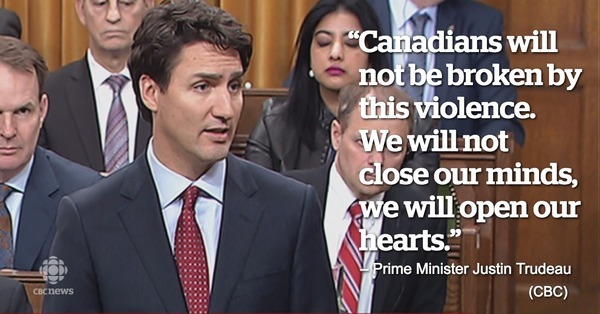 It’s a Canadian tragedy reflecting the shift to the Right affecting various countries. Abdelkrim Hassane, 41, was a programming analyst for the Quebec government. All victims had children and all victims were Canadians, whatever their origin. A fund is being raised to cover funeral costs. We are awaiting details regarding the wounded. I feel very sorry for the family of victims and offer sincere condolences. I have just watched the inauguration of President Donald J. Trump. His address was ambivalent. After thanking attending former Presidents, he stated that as of 20 January 2017, it would be a new America. It was as though no one came before him. President Abraham Lincoln and President John F. Kennedy were assassinated, but he did not name them. He did not mention Franklin Delano Roosevelt nor did he mention Mrs. Clinton, whom he defeated. He didn’t say that when President Obama took office, the United States had to pay a huge debt accrued during wars waged in the Middle East. America had been great in an undefined and somewhat mythical past and he would make it great again because power would not be in the hands of politicians in Washington. He was giving it to the people. He did not address the larger issues: the climate, the oceans, the rainforest, peace in the Middle East. However, he will crush terrorism. Although America renews itself with each administration, it has a past and it must keep up with the times. President Obama has left the United States in much better condition than it was in 1908, and the Affordable Care Act was a landmark. Mr Trump said that the carnage was over. Yet he was endorsed by the National Rifle Association, who oppose gun-control, and the Ku Klux Klan, who peddle hate. Yet, while I bemoan President Trump’s indictment of all the leaders who preceded him and his messianic discourse, I don’t think he meant to trivialize the four former Presidents who attended the inauguration. He escorted the Obamas to their helicopter quite cordially and then took Melania’s hand and walked her back to the stairs. They turned and stood until the helicopter departed.